Steph Curry and Chris Paul renew their playoff rivalry, this time with Paul in a different uniform. They had the two of the five most efficient offenses in NBA history. The Rockets set an all-time record for 3-pointers, while the Warriors were the league's best shooting team both inside the paint and out. 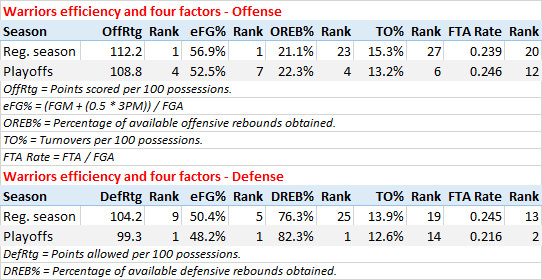 Here are some statistical notes to get you ready for the Western Conference finals, with links to let you dive in and explore more. Game 1 is Monday (9 p.m. ET on TNT). Only team that hasn't lost a game that was within five points in the last five minutes in the playoffs. They're 2-0 in those games. Turnover rate of 9.8 per 100 possessions is the second lowest postseason rate in the 41 years since the league started counting turnovers. The only lower rate (9.6 per 100) belonged the 2006-07 Washington Wizards, who were swept in the first round. Rank last in the playoffs in both player movement (5.6 miles traveled per 24 minutes of possession) and ball movement (252 passes per 24 minutes of possession), according to Second Spectrum tracking. 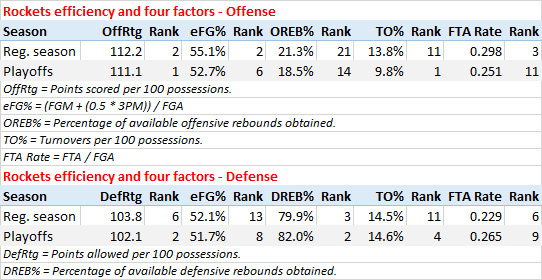 Only team that has been better than the league average in each of the defensive four factors in the playoffs. James Harden ranks second in the postseason in usage rate, having used 37 percent of the Rockets' possessions while he's been on the floor. He ranks in the top 10 in points (fourth), assists (eighth), steals (third), 3-pointers (fourth) and free throws (third) per game. Harden has averaged a postseason-high 10.0 isolation possessions per game. His 1.04 points per possession on isolations ranks ninth among 21 players who have averaged at least three isolation possessions per game and is down from a league-best 1.22 in the regular season. Rank 11th in the playoffs in player movement (6.5 miles traveled per 24 minutes of possession) and first in ball movement (390 passes per 24 minutes of possession), according to Second Spectrum tracking. Have assisted on 70 percent of their field goals, the highest rate in the playoffs. Have had five games of at least 30 assists, more than all other teams combined (four). Also lead the postseason in secondary assists (3.9 per game) and assist/turnover ratio (2.15). The Rockets (2.12) are the only other team above 2.0 in the latter. Stephen Curry leads the playoffs with 7.8 fast break points per game. He has averaged 5.19 miles per hour on offense, the highest rate among players who have played at least 20 minutes per game. Green totaled 47 points, 32 rebounds and 29 assists, one assist shy from averaging a triple-double over the three games. He shot 58 percent, his best mark vs. any Western Conference opponent.